Outdoor concrete is an investment – and one that is often at the mercy of the elements. Protecting this valuable investment is essential to preventing trouble down the road. With proper curing, sealing and maintenance, concrete is an asset that can last for years to come. We’re sharing 7 tips to help you maintain your outdoor concrete. Here in Utah, we have extreme temperature variables throughout the year. Outdoor concrete surfaces can take a beating, especially in summer and winter. Snow run-off and spring rains can cause damage if it sits on the surface too long. Be sure to slope concrete away from the home to prevent water damage to the surface and the foundation. Rain, snow, ice and heat can affect concrete curing times. The ideal temperature for pouring and curing concrete is between 50 and 90 degrees. Extremes in either direction may compromise the final product. Too cold and the freeze-thaw cycle can cause concrete to expand and contract, creating cracking and spalling. Too hot and the concrete will set faster but may compromise strength. In other words, concrete must be cured properly to achieve maximum durability. Choosing the right sealer for your concrete project is an integral part of finishing the job right. This final layer of protection can enhance the appearance of decorative concrete; block against moisture, dirt, oil and stains; and protect against excess wear. The type of concrete sealer used will depend on the type of project. Two of our most commonly requested sealers are W.R. Meadows for commercial and industrial application, and ICS High Gloss Sealer for decorative concrete applications. Find the right sealer for your project here. Practice basic maintenance by cleaning concrete surfaces immediately of spills and debris to minimize staining or other damage. This includes weeds and grass, oil, tire marks and more. Frequent cleaning keeps outdoor concrete surfaces looking their best. Once your patio is clean and repaired, protect it from future stains and damage with a concrete sealer. A clean surface is key to properly staining or painting concrete. Before applying a top coat, stain or other decorative concrete, sweep and pressure wash the concrete surface. Recoat concrete every three to five years to protect the surface, especially in high-traffic areas like driveways, walkways and patios. Check concrete foundation walls, floors and slabs for cracking, heaving or deterioration as part of routine maintenance. Some cracks are minor and can be repaired. If the crack is the width of a nickel, it’s time to call a professional. Intermountain Concrete Specialties has locations in Utah and Idaho where our concrete experts can help you make the most of your investment by providing maintenance and protection solutions for your specific concrete needs. An ounce of prevention is worth a pound of cure. Keep these 7 tips in mind when pouring, curing, cleaning and sealing concrete for a concrete investment that lasts. Spring has sprung in Utah and the arrival of warm weather makes us want to head outdoors. It’s the perfect time to clear out the clutter and start fresh, but save the closet organizing for rainy days. Instead, tackle these outdoor spring cleaning and home maintenance projects to get your home ready for spring. The first step to deck, patio and porch maintenance is a good spring cleaning. Sweep and power wash, clear weeds and debris, and check for loose steps or railings. If you notice cracks in concrete patios, follow the same steps we recommend below for sidewalks. 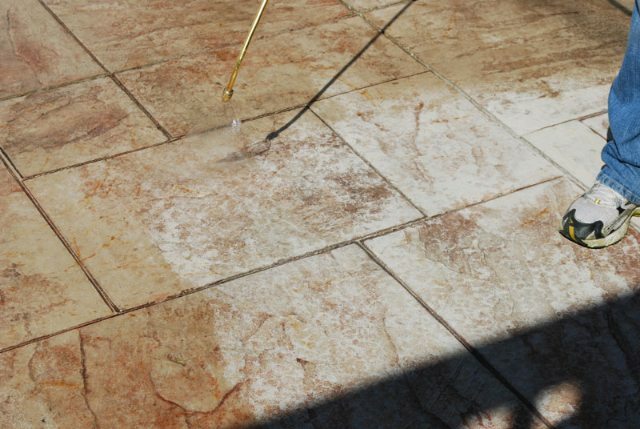 Once your patio is clean and repaired, protect it from future stains and damage with a concrete sealer. Consider beautifying with decorative stamped concrete to enhance home value and appearance. Concrete sidewalks can take a beating in winter. The first step to spring concrete maintenance is a good cleaning. Sweep away any debris so you can get a good look at the current condition. Next, carefully inspect concrete, checking for cracked or crumbling areas. Visit one of Intermountain Concrete Specialties six locations in Utah and Idaho the products, tools and tips you need to repair concrete cracks before damage progresses. Check concrete foundation walls, floors and slabs for cracking, heaving or deterioration. Some cracks are minor and can be repaired. If the crack is the width of a nickel, it’s time to call a professional. Winter can take a toll on your roof so perform a close inspection each spring. Check flashings, and look for punctured, cracked, curled or missing shingles. Some are visible from the ground, but it’s a good idea to get a closer look to see if roof maintenance is required. Gutters and downspouts need to be clear of obstructions to properly manage rain water and to prevent moisture damage to your home. Clear leaves and other winter debris from gutters, reattach loose ones, and make sure water runoff is directed away from the house. If there are leaks, dry the area and use caulk or epoxy to seal. Check for loose siding panels and ensure the flashing is in place. Clean siding with a pressure washer to remove winter’s dirt and debris. Take care of any necessary exterior siding repairs or painting. Routine maintenance on your central HVAC unit can improve airflow, which in turn can lower heating and cooling costs. If you have an outdoor unit, remove dust, leaves, grass clipping and any other debris that may be blocking airflow. Be sure to shut power to the unit before performing any maintenance. HVAC spring maintenance is definitely something you want to tackle before Utah’s summer heat kicks in. This is a given when it comes to spring home maintenance. Clear dead leaves, branches and other debris; clean out garden and flower beds; prune and trim trees and shrubs; and reseed thin or damaged areas of the lawn. Check for leaky valves and broken or clogged sprinkler heads. Clean or replace poorly performing sprinklers, check operating pressure, and adjust sprinkler heads as necessary. Open the main water valve slowly to allow pipes to fill gradually and avoid bursting a pipe. Check screens for punctures or holes, and inspect windowsills and doorways for cracks and potential leaks. To protect from spring rains, remove eroded caulk and fill cracks with fresh exterior caulking. Repaint and seal for a beautiful home enhancement. Your Utah home is one of the biggest investments you will ever make. Take care of it with spring cleaning and home maintenance so you can enjoy a safe and beautiful home for years to come. Don’t forget to check out our list of 7 Outdoor Concrete Projects for Spring and the 10 concrete products you need to make them happen! As fall turns to winter, temperature plays a critical role in sealing concrete. In fact, temperature is the number two cause of concrete sealing problems, second only to moisture. That means taking extra precautions to make sure concrete sealing is done right in cold weather. When it comes to properly concrete sealing, both air and surface temperature play a role in proper sealing. Why? Once applied, sealers create a chemical reaction and the outside temperature decides how fast that reaction occurs—or if it happens at all. Most manufacturers recommend 50 to 90 degrees as the ideal temperature range for applying concrete sealer. So what happens if you apply concrete sealer outside of that 40-degree range? Extreme temperatures will cause the sealer to apply too fast or too slow. Sealer reaction can also be affected by humidity, wind chill factor, and even time of day sealer is applied. High temperatures cause sealer reactivity to increase. That means the hotter it is, the faster you’ll have to work to get the concrete sealer applied. High temperatures can result in “spider webs” when the solvent flashes before the sealer can form a film, or bubbles when the solvent flashes too fast and traps air. Alternately, if the temperature is below 50 degrees, the chemical reaction slows and the time needed to properly seal concrete increases. Every concrete sealer has a minimum film-forming temperature (MFFT). This is the minimum temperature needed for the sealer to form a film, cure, and harden. If too much time passes, due to a too-cold surface temperature, you’ll end up with a weak sealer. If the temperature is significantly below the MFFT, curing stops completely, and a white residue will be left behind on the concrete surface. This is why it’s important to seal concrete properly before cold weather sets in. As we transition from fall to winter and temperatures continue to drop, consider using concrete curing blankets to make sure concrete is properly cured and sealed. Remember, the colder the temperature, the longer it takes to cure and seal concrete. Proper curing and sealing of any concrete surface is critical to the projects long-term durability. Click here to learn about different concrete sealers, or visit Intermountain Concrete Specialties for expert tips and the best concrete sealers in the industry. It’s time to seal the deal and get started on that concrete project you’ve been putting off—and Intermountain Concrete Specialties has a great incentive for you to put your concrete plan in action! For a limited time, we’re offering a free pail of CS309-25 Non-Yellowing Acrylic Curing and Sealing Compound with the purchase of any 10 bags of FLOOR-TOP STG and/or SPECTRUM RE-KOTE TF from concrete manufacturer W.R. Meadows. Why is CS309-25 one of our all-time favorite exterior concrete sealers? This industrial-quality sealer is a true workhorse, designed to improve resistance to chemicals, oil, grease, deicing salts and more. It applies easily and dries quickly with a clear, non-yellowing, acrylic finish. CS309-25 concrete sealer is specially formulated with acrylic polymers that effectively cure and seal freshly placed concrete, to provide a durable, long-lasting finish. As more states implement stricter air quality regulations, VOC laws are changing. VOC stands for Volatile Organic Compound—which basically translates to how solvents react with the atmosphere. The goal of improved VOC laws is less harm to the ozone layers, which ultimately affects air quality. 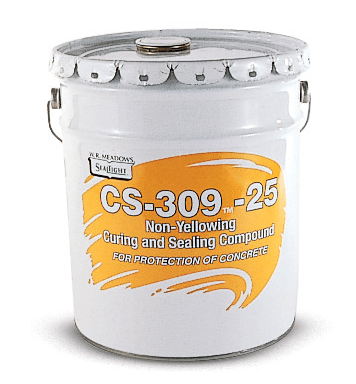 Fortunately, CS-309-25 Non-Yellowing Acrylic Curing and Sealing Compound is VOC-compliant to date, and Intermountain Concrete Specialties locations have it readily available in large quantities. It’s the perfect opportunity to seal the deal on your next concrete project. CS309-25 concrete sealer is the ideal concrete sealer when paired with W.R. Meadows FLOOR-TOP STG Concrete Floor Topping or SPECTRUM RE-KOTE TF Concrete Repair Mortar and Resurfacer. FLOOR-TOP STG is a single-component, self-leveling floor topping and underlayment. Ideal for smoothing out rough, uneven, or slightly deteriorated interior concrete floors, FLOOR-TOP STG cures to a hard surface suitable for standard foot traffic and light rubber-wheeled traffic, and can be enhanced with integral colors, dyes, stains, and sealers. stock up on CS-309-25. Intermountain Concrete Specialties and W. R. MEADOWS have you covered for all your concrete flooring needs. Concrete resurfacing brings new life to old concrete. Are you tired of looking at a drab concrete patio, cracked driveway, or discolored garage floor? You may be able to restore and resurface existing concrete, without having to replace it with the best concrete supplies. Is my concrete suitable for resurfacing? The answer is usually yes if your concrete is in fairly good condition but needs minor repairs and an updated finish. Concrete can usually be resurfaced with some of our concrete supplies if it has minor cracks or discoloration, but not any major damage such as sinking, missing pieces or major cracks. A properly prepared surface makes all the difference in the final result when it comes to concrete resurfacing. 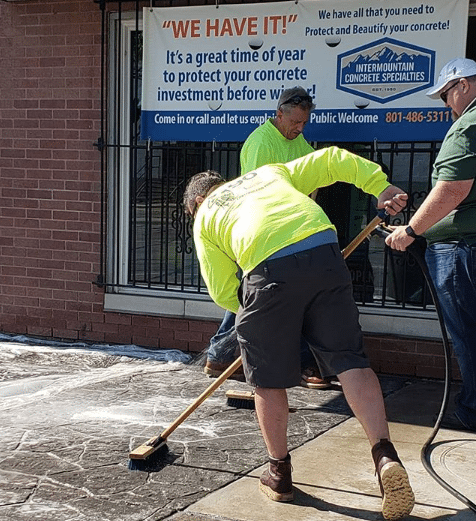 Start out by completely cleaning the concrete surface using an appropriate solution (Intermountain Concrete Specialties can guide you on choosing the best product). Next, repair any cracks. Priming isn’t typically necessary if you’re staining concrete, but other finishes may require profiling. The best advice is to follow manufacturer’s instructions. What are the options for concrete resurfacing? Concrete overlays / microtoppings is the application of a thin cement or polymer-modified layer over existing concrete to upgrade the appearance of a concrete surface. After the overlay has been applied, it can be stamped, stained or stenciled to mimic the look of brick, slate or stone. Stamped/textured concrete is a creative and affordable option for beautifying outdoor areas such as patios and walkways. Stamped concrete is usually more affordable than tearing out existing concrete and replacing it with new materials. Modern concrete resurfacing methods can easily replicate the look of stone, slate, tile, wood, brick and more. Staining adds color and brings new life to old concrete. Stain can be used on existing concrete or on concrete overlays. Concrete staining also works well in conjunction with stamped concrete. Other decorative finishes such as stencils and borders are a great way to stylize existing concrete while adding color and personality. Proper curing and sealing of any concrete surface is critical to the long-term success. Most concrete surfaces are resistant to stains when properly coated with a protective sealer. The type of concrete sealer you choose is largely dependent on your project. Learn about different concrete sealers here, or visit an Intermountain Concrete Specialties location near you for tips and advice. One question we get asked often at Intermountain Concrete Specialties is which concrete sealer is best. Choosing the correct sealer depends on the type of concrete project, which usually dictates whether a surface sealer or a penetrating sealer is the best option. Surface sealers work in one of two ways: by forming a protective, impermeable layer on the concrete surface, or by blocking the pores in concrete to prevent water absorption. Penetrating sealers absorb into the concrete, and are ideal for protecting exterior concrete surfaces from damage due to exposure such as rain and ice. For decorative concrete, ICS High Gloss Non-Yellowing Sealer enhances the surface with a high-shine, glossy finish. Formulated to seal and protect concrete surfaces by producing a hard yet breathable, high-sheen finish, this non-yellowing, acrylic-based, sealing compound is transparent, durable, and easy to apply. Use ICS High Gloss Sealer on decorative concrete for a quick-drying, high-gloss finish, and improved resistance to UV light, water, alkalis and more. 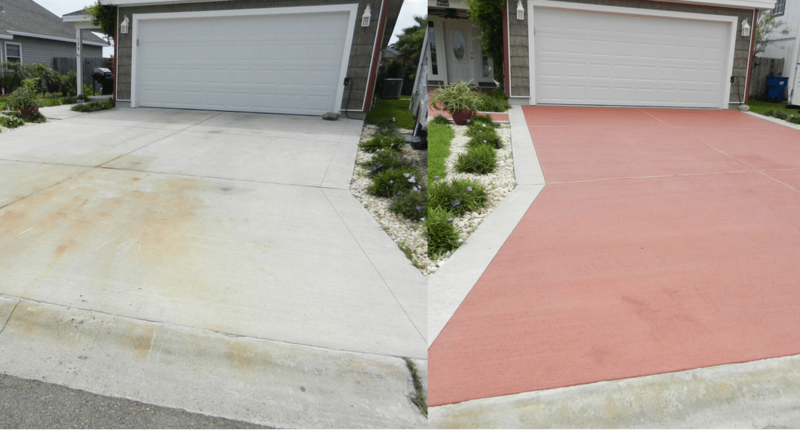 When it comes to curing and sealing exterior concrete surfaces such as driveways, sidewalks, driveways and patios, CS309-25 Non-Yellowing, Acrylic Curing and Sealing Compound provides a durable, long-lasting finish. This industrial-quality sealer by W. R. Meadows is a true workhorse, formulated to improve resistance to chemicals, oil, grease, deicing salts, and abrasion. CS309-25 applies easily and dries quickly with a clear, non-yellowing, acrylic finish. Also from W.R. Meadows, VOCOMP-25 is a water-based, acrylic concrete curing and sealing compound ideal for sidewalks, patios, pool areas, and commercial/industrial flooring. Available in a quick-drying, ready-to-use formula, it enhances surface appearance and improves resistance to rain, sun, freezing temperatures, many chemicals and acids, deicing salts, and abrasives. VOCOMP-25 applies with a blue cast for easy-to-see coverage and then dries clear with a medium sheen. The more coats applied, the higher the sheen. What makes VOCOMP-25 a standout is that it can be used on new, old, interior, exterior, horizontal, and vertical concrete surfaces. Masterprotect H400 40% silane penetrating sealer provides long-lasting protection against moisture, freezing and thawing, and chloride intrusion. For interior or exterior use, Masterprotect H 400 is an ideal penetrating sealer for concrete highways, parking garages, stadiums and other high-traffic concrete surfaces. When you need to protect concrete surfaces against damage from severe elements, such as heavy wind-driven rain, freeze/thaw cycles, and intense moisture, turn to Pentra Sil 244+. This premium hardener, densifier, and concrete sealer reduces permeability and protects concrete surfaces with a single application. It works by reacting with free calcium to form insoluble calcium silica hydrate, making concrete more water-, stain-, and abrasion-resistant for easier maintenance and durability. Pentra Sil 244+ can be sprayed on new or existing concrete. 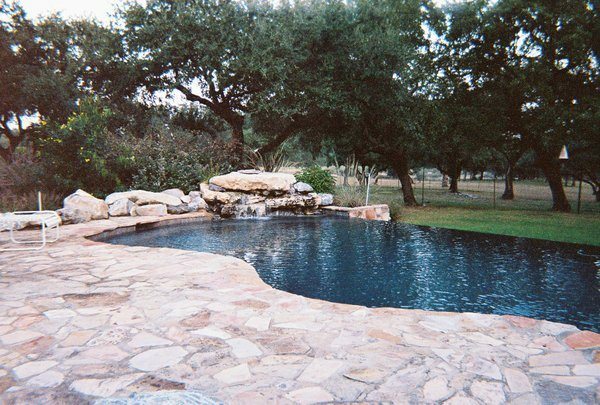 If you’re looking to protect concrete pool decks, around waterfalls, and other concrete surfaces prone to water exposure, choose DECK-O-SHIELD by W. R. Meadows, Inc. This ready-to-use, water-based sealer acts as a water-repellant. DECK-O-SHIELD works by penetrating the concrete surface to form a barrier against moisture, and helps protect against salt staining, rust, and spills. Best of all, it won’t alter the color of your concrete, so the appearance of decorative concrete surfaces stays true. Creto Deep Penetrating Sealer is another option for waterproofing new or existing concrete. Creto DPS goes deep to form a gel under the surface of the concrete to block moisture from migrating to the surface, while still allowing concrete to breathe. Creto DPS is ideal for home and commercial use on concrete sidewalks, basements, retaining walls, highway bridges, garages and more. Decraseal WB is a non-yellowing, acrylic-based, curing and sealing compound for decorative concrete. Clear, transparent and easy to apply, Decra-Seal offers improved resistance to water, alkalis and mild acids with a hard yet flexible, clear film. Decra-Seal is specifically formulated for decorative concrete. 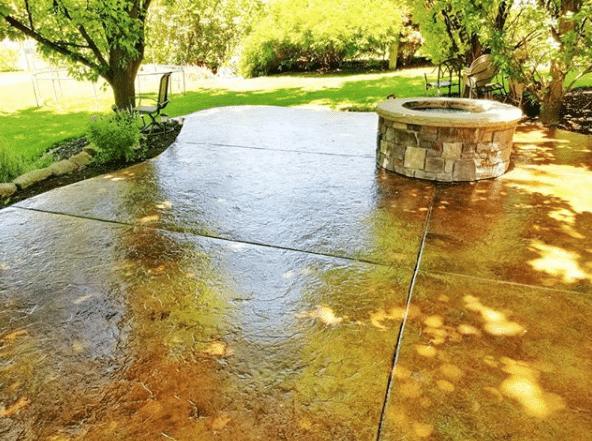 See our guide to Choosing the Right Concrete Sealer, or visit any Intermountain Concrete Specialties location in Utah and Idaho to speak with one of our concrete experts. The type of concrete sealer you choose will depend on the type of project. Two of our most commonly requested sealers are W.R. Meadows CS309-25 for commercial and industrial application, and ICS High Gloss Sealer for decorative concrete applications. ICS High Gloss Non-Yellowing Sealer enhances the architectural and aesthetic qualities of decorative concrete surfaces with a lustrous, glossy finish. ICS High Gloss Sealer has been formulated to seal, protect, and enhance concrete by producing a hard, breathable, long-lasting, attractive, high-sheen finish. This non-yellowing, acrylic-based, liquid sealing compound is clear, transparent, durable, and easy to apply. The quick-drying, high gloss concrete sealer can be used on colored and stamped concrete surfaces and may brighten the natural coloration. ICS High Gloss features superior moisture retention, but should not be applied to concrete that will be exposed to excessive moisture. It offers improved resistance against UV light, water, salt, oil, alkalis, mild acids and petroleum spirits. ICS High Gloss Non-Yellowing Sealer can be applied to horizontal or vertical surfaces. In contrast to ICS High Gloss Sealer for decorative concrete surfaces, CS309-25 Non-Yellowing, Acrylic Curing and Sealing Compound is a “workhorse” sealer used to simultaneously cure and seal exterior concrete surfaces such as driveways, sidewalks, patios, parking areas, and other typically gray concrete surfaces. The use of CS-309-25 on any exterior concrete surface provides a durable, long-lasting finish that offers improved resistance to chemicals, oil, grease, deicing salts, and abrasion. This W.R. Meadows sealer applies easily and dries quickly for less down time. CS309-25’s clear, transparent, ready-to-apply, non-yellowing liquid compound is formulated from special acrylic polymers and quick-evaporating solvents that effectively cures and seals freshly placed concrete. When properly applied, CS-309-25 produces a hard, dense, high compressive strength concrete that offers improved resistance to chemicals, oil, grease, deicing salts, and abrasion. CS309-25 Non-Yellowing, Acrylic Curing and Sealing Compound will minimize hair-checking as well as premature cracking, dusting, spalling, and other common defects that result when concrete is not properly cured. Both CS-309-25 and ICS High Gloss sealers are VOC-compliant. Remember, no one sealer is right for every job. Not sure which to choose? Visit the Intermountain Concrete Specialties location nearest you to speak with one of our experts to find the right sealer for your concrete project.